"Cinnamon rolls in a waffle form! Serve with bacon and fruit for a special breakfast." Preheat a waffle iron according to manufacturer's instructions and spray with non-stick cooking spray. Whisk whole wheat flax flour, white sugar, baking powder, and baking soda together in a large bowl. Whisk eggs, buttermilk, 1 tablespoon melted butter, and vanilla extract together in a separate bowl; pour into flour mixture and stir just until batter is combined. Pour about 1/3 cup batter into waffle iron; close lid and bake until golden brown, about 2 minutes. Repeat with remaining batter, keeping waffles warm. Whisk brown sugar, 3 tablespoons melted butter, hot water, and cinnamon together in a small microwave-safe bowl; cook in the microwave on High until cinnamon drizzle can be poured, about 10 seconds. Whisk confectioners' sugar, skim milk, and 1 tablespoon melted butter together in a small bowl until icing drizzle is smooth and can be poured. 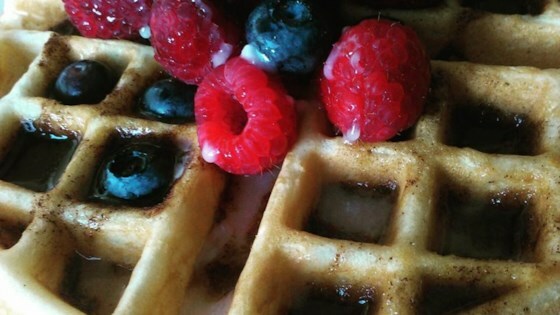 Place 2 waffles on a plate; drizzle with 2 tablespoons cinnamon drizzle, then drizzle with 2 tablespoons icing drizzle. Add 1 tablespoon lemon juice to enough skim milk to make 2 cups as a substitute for buttermilk. Made this for Mothers day brunch and had a happy bunch on my hands. We ate them with whipped cream and fresh fruit & nuts! Oh wow. Doing this again! Would not make again. Waffles were unacceptable. With icing and brown sugar drizzle. Way to sweet. The waffles were flavorless, runny, and chewy. The icing was good.